The mornings here have been absolutely amazing this spring. The temperatures have been cool with light breezes and the first sun rays filtering through the large oak trees. So quiet, so peaceful; this makes for a perfect setting for observing the wildlife all around us. God’s creation is absolutely awesome! The first thing I do in the mornings is head for the coffee maker and with my coffee cup in hand go outside to my swing on our back porch. 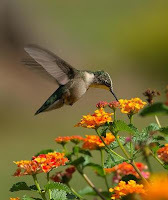 Watching the hummingbirds flying from flower to flower, from feeder to feeder is so amazing. This time of year they are busy building their nests and preparing to raise their families. I have put lint and cotton on our fence for the hummers to collect and line the bed of their nests. It is so awesome to see them hard at work gathering the cotton and flying off at such speeds into the trees to complete the soft bedding so they can lay their eggs. How do they know what the cotton is for and how to use it? They just know; they just know how to make their way back to my back yard each year. They just know how to find their mate, they just know how to build those amazing nests, and they are amazing! They just know which flowers & feeders have the nectar they need for their energy and nourishment. They just know! Because God has created them to “know” and He has provided all they need. So in reflecting while having my morning coffee, I am reminded of the scriptures in Matthew 6:25-34. Holy Spirit always talks to me while I am on my swing, really cool!